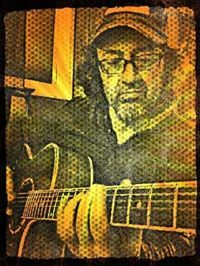 For over three decades, Jamie Gray has been traversing musical landscapes, honing his skills and performing original music that humbly adds to the cannon that is Americana. Versed in bass guitar and harmonica, Gray’s proficiency is with the acoustic guitar. His percussive approach is two parts rhythm, one part melody. While his guitar influences are reminiscent of John Prine and Jerry Garcia, his unique, soulful voice is sprinkled with hints of James Taylor and Jay Farrar. A traveler in both time and space, Gray is often found gigging throughout the Northeast—whether in a bar, club, coffee house, an online concert series, or happily jamming with friends at an intimate house party. His long-awaited first album, Anywhere, has received praise and accolades throughout the United States and Europe. An affable bard, Gray is currently working on material for a follow-up album, gigs regularly and is planning to expand his horizons with a European tour. I haven't played in the streets since I was a kid and mom told me not to. Honestly, I can't recall ever being embarrassed. It's not that I haven't humiliated myself horribly...it's just that I've done it so often, I've gotten REALLY good at blocking out the memory. And the older I get, the easier I forget. I still have my first guitar. It's a piece of crap, but it's MY piece of crap.